Photochromics (PCs) change from a near Invisible state when not exposed to UV Light (e.g. indoors) to a coloured state when exposed to UV Light (e.g. outdoors). 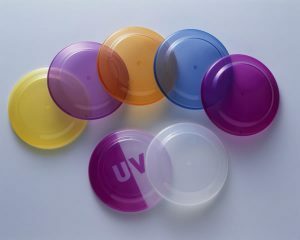 They have a Fast Reversible Transition with Intense colour in 15 seconds returning to clear after 5 minutes indoors.